NHS England’s chief executive Simon Stevens set out his blueprint last month to encourage workplaces to reward staff for taking part in healthier lifestyles. Companies will be given NHS money or shopping vouchers to praise staff for losing weight in a bid to get workforces around the country more active. Incentives could be higher or lower depending on the amount of weight shed. Creative communications agency OPR in Newcastle is already well underway, with a line up on healthy workplace activities. The team, based in Ouseburn, has recently launched its own official Run England club to encourage its staff, and those of nearby businesses, to keep fit and stay healthy while at work. As well as the running club, which takes place daily during lunch hours, the team has implemented a calendar of health and fitness regimes into their working lives, including posture and back pain sessions, hydration awareness days, health MOTs and weekly bulletins with healthy recipe ideas. The series of activities form part of the company’s NHS North East Better Health at Work Award scheme, which it is currently completing, and is aiming to achieve the bronze award in January. NHS North East Better Health at Work Awards recognise the efforts of local employers in addressing health issues within the workplace and encourages businesses to promote healthy lifestyles and consider the health of its employees. The award recognises the achievements of these organisations and helps them move forward in a structured and supported way. Agency manager Gemma Graham is OPR’s Better Health at Work workplace health advocate, and recently completed the official Run England Leadership in Running Fitness course to enable the company to register an official running club. She said: “With NHS England chief executive Simon Stevens recently suggesting that employers are the key to promoting better health in the population and that he wanted to see measures to encourage participation in Weight Watchers-type schemes, we are proud to promote the fact that we are already addressing health and fitness as a project within our workplace. “Health and wellbeing is a massive part of the culture here at OPR and something we take seriously. A healthy team is a happy team and we are lucky to have a great bunch of active people who enjoy keeping fit and who have embraced our new running club. “We had several members of staff taking part in other running activities this year thanks to the training and support they have gained through our running club, including the North Tyneside 10k and the Great North Run. “As well as the running club, we have encouraged staff to take part in annual health awareness campaigns such as ‘Dry January’ and ‘Sober October’ for alcohol awareness, Stoptober for stop smoking month and World Mental Health Day for mental wellbeing. Staying healthy at work is as important for employers as it is for employees. It is estimated that as many as 1.6m working days were lost due to workplace injury and ill health in the North East in 2011/12 and, on average, the reported cost of absence per employee per year was £595 in 2013. OPR managing director Kari Owers said: “We take the health and wellbeing of our team very seriously and try to encourage not only a healthy lifestyle, but a good work-life balance. “We have had a year of exciting growth as a business, so we have also ensured we have kept an intense focus on health and wellbeing as we appreciate that our most important asset is our people. “The nature of our industry is very demanding, often working at evening events, meeting tight press deadlines and always being switched on to technology and social media, so encouraging our team to reclaim their lunch breaks and take some ‘time out’ gives them the chance to recharge their batteries. “The Better Health at Work activities have also increased job satisfaction, making for a happy and contented team.” OPR has also enlisted the support of leading personal trainer Dominic Bowser, of Benton-based health and fitness centre Sound Mind and Body, to host regular back pain and posture sessions to help them with any postural problems they may encounter while sitting at desks at work. Dominic says there are three things which can have a significant impact on health in the workplace – posture, snacking and stress. He said: “People sitting down for long periods of time can begin to slouch without realising and with bad posture comes stiff necks and bad backs. “This can lead to further health problems that could easily be prevented with the right knowledge of chair and computer position. “Busy executives often have hectic schedules and meetings to attend and so can fall into the trap of snacking on unhealthy foods on the go rather than preparing wholesome meals in advance, leading to weight gain and lack of productivity. Stress can also have a significant impact on weight gain, resulting in cravings for foods high in sugar, salt and fat. Leave the sweet treats in the shop and reach for nuts and fruits to satisfy surges of hunger. “At our gym, we advise busy employees looking to inject exercise into their day to take a 10 to 20 minute walk at lunchtime or walk to and from work to help de-stress and get their heart rate up. 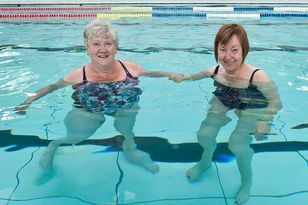 More than two years ago, The Journal launched its Great North Fitness Revolution to encourage people of all ages, shapes and sizes to keep active through regular exercise and by adopting a good diet. For anyone interested in joining OPR’s running club in the Ouseburn area contact agency manager Gemma Graham on 0191 232 5690 for meeting points, times and dates.